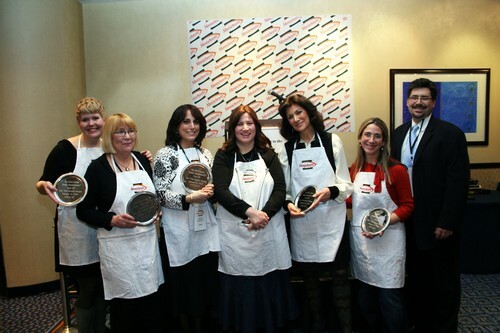 SECAUCUS, NJ (February 2009) — The Manischewitz Company named Amy Siegel of Clifton, NJ Grand Champion of the Third Annual Simply Manischewitz Cook-Off . Out of thousands of recipe entries nationwide, six finalists were chosen to compete in a live cook-off held at the NY Marriott Marquis on February 13, 2009. Amy Siegel’s Marvelous Mediterranean Falafel Sliders topped five other award-winning recipes, allowing her to take home the $25,000 grand prize package which includes GE Profile kitchen appliances, cash and more. In addition, the day of the Cook-Off was proclaimed “Simply Manischewitz Cook-Off Day” by Mayor Bloomberg of New York City. Amy, 37 years old, is a stay-at-home mother of three. She is an active volunteer with a local non-profit organization called “Hand in Hand,” which provides food for senior citizens and, despite her hectic schedule, Amy finds the time to devote to her favorite past time: cooking. She is a familiar face in the competitive cooking circuit and was a semi-finalist in the 2007 Simply Manischewitz Cook-Off . As a serial cooking contestant, Amy stays up-to-the minute on contest opportunities by participating in an active online cooking community called Contestcooking.com. Amy’s previous contest honors include: 2007 Semifinalist of the Crisco Country Music Cook-Off, Runner-up in the 2007 Alouette Spreadable Cheese Recipe Contest and Grand Prize Winner of the 2004 Kraft recipe contest. 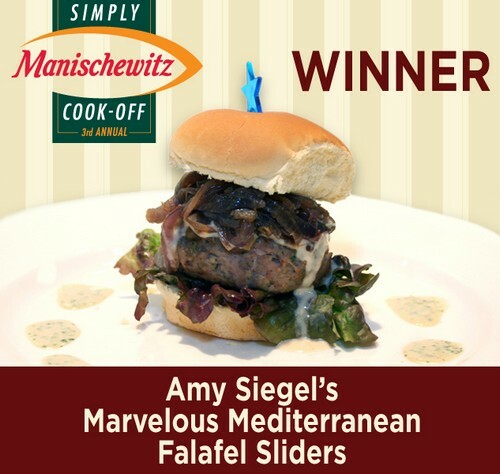 “The competition was extremely stiff, and the scoring very tight, but Amy Siegel’s Marvelous Mediterranean Falafel Sliders consistently scored high enough to take home the top honors for best overall recipe,” said David Rossi, Vice President of Marketing for The Manischewitz Company. The Grand Prize Winner was chosen by a panel of prestigious food experts including Todd Coleman, Food Editor, Saveur magazine; Emily Kaiser, Food Associate Editor, Food & Wine magazine; Michael Park, Epicurious.com ; Jacob Schiffman, foodnetwork.com ; and winner of the 2008 Simply Manischewitz Cook-Off , Joy Devor of Rockaway, NY. The final recipes were judged on the following criteria: Taste- 50%, Ease of Preparation- 20%, Appearance-15%, Originality and Creativity- 15%. 1. In a large mixing bowl, combine falafel mix, turkey, mint leaves, black pepper to taste and 3-4 tablespoons cold water to moisten. Shape mixture into 12 small patties. Heat a grill pan or large skillet over medium-high heat. Spray with nonstick cooking spray. Grill patties for 3-5 minutes per side, until no longer pink in center. Meanwhile, heat a large skillet over medium high heat. Add olive oil and Bermuda onion. Sauté for 10-12 minutes, until softened and golden. In a small bowl, stir together tehina with ¼ cup water. Add more water to make a thinner sauce, if desired, set aside. Heat rolls in a 250 degree F oven for 5 minutes or until warm. 2. To assemble slider; on a plate, place bottom of roll, lettuce leaf, cooked patty, onions, 1 tbsp tehina, and top of roll. Garnish with additional chopped mint leaves. Serve remaining techina sauce on the side for dipping. *You can use regular and light varieties of ground turkey however the regular variety works best in this recipe. In August 2004, the company changed its name from The B. Manischewitz Company, LLC to R.A.B. Food Group, LLC and today is now known as The Manischewitz Company . The Manischewitz Company is a specialty food company that includes the Manischewitz brand® , Season® , Guiltless Gourmet® , Asian Harvest® , Rokeach® , Mishpacha® , Horowitz Margareten® , Jason® , Mother’s® , Carmel® , Croyden House® , Mrs. Adler’s® and Goodman’s® brands. The company offers a diversified line of premium kosher food products that covers over 60 different categories. The Manischewitz brand was founded in a small bakery built to make Passover matzo in 1888 by Rabbi Dov Behr Manischewitz in Cincinnati, Ohio. In 1932, Rabbi Manischewitz opened a plant in Jersey City, NJ, replacing the operation in Cincinnati. This move paved the way for the introduction of new products like Tam Tam® Crackers, Chicken Soup, Noodles and Gefilte Fish. Today, all plant operations take place in Newark, NJ. Manischewitz continues to introduce unique, delicious, premium specialty food products such as coating crumbs, dairy-free frostings and more.